The marathon is a long-distance running event with an official distance of 42.195 kilometers usually run as a road race. The event was instituted in commemoration of the fabled run of the Greek soldier Pheidippides, a messenger from the Battle of Marathon to Athens. The marathon was one of the original modern Olympic events in 1896. 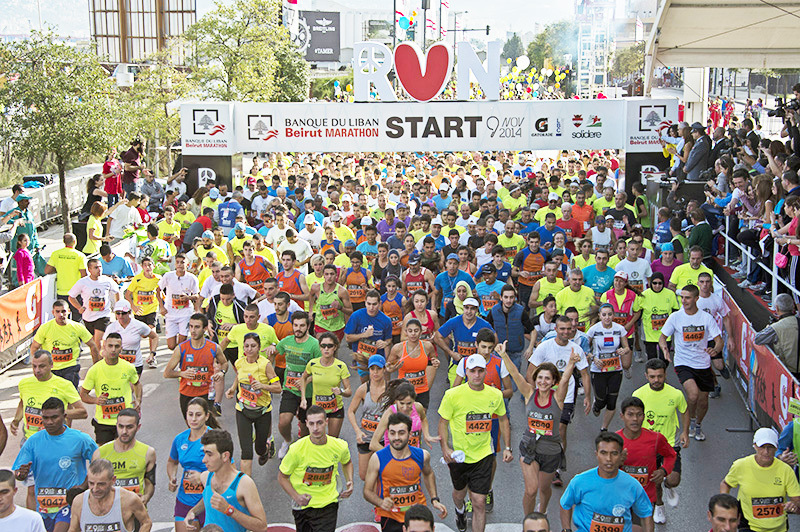 The first Beirut Marathon was launched in October 2003 born from a single runner’s, May El-Khalil’s, dream of creating an international running event in Lebanon. It has the theme of unity as its core. In the first marathon, over 6,000 people from 49 different countries participated. By 2014, the race and social movement attracted over 38,000 runners from 104 countries. In 2001, El Khalil suffered a near-fatal accident that placed her in a coma. She spent two years undergoing dozens of surgeries that enabled her to walk again. Determined to celebrate the gift of life and mobility, she founded the marathon to help mend divisions in Lebanon. She wanted to shift the focus from that which divides the Lebanese people, and bring them together to celebrate that which they have in common; their love for exercise and their relationships with friends and family. She founded the largest running event in the Middle East as an instrument of peace through sports. The assertion she made in her ted talk was that “peacemaking was not a sprint, but a marathon”, meaning that this kind of endeavor was a long race that requires commitment, endurance, and optimal belief in the ultimate goal. I too believe that life is a marathon. It isn’t easy. It is graceful though with its challenges. Time will come, when you will question your ability to keep moving forward, even the sunniest of days could leave you feeling weak and rundown and it stops you in your tracks. Like hitting a runner’s wall, breathless stinging lungs scream out against the lack of oxygen, but we always find something worth redeeming, a helping hand offering us some much needed hydration, or friendly words of encouragement from strangers. Life is a marathon and we can’t allow the runner’s wall to stop us from moving forward. That’s why on that one day in Lebanon we run forward, we run together side by side, just one foot in front of the other. We are not really counting steps, not miles, not minutes, not seconds, or calories, just a rhythm, pounding, pacing, pulse quickening, breathing deeply, settling steadily to the sound of the footfalls. It’s a mindless carrying on of our legs, a welcome counter to the emptying of our heads. We have all been together, for so very long, lived through so much. We have made each other weak, inspired each other to be strong. Now here we are, all running, heading the same direction towards one goal. We are all one, for a brief moment just trying our best, trying to move on into a better future. So, May (El Khalil and the wish), we always run together towards one goal. This is a great post, thank you. Good luck in the race!